Why Does Thailand Have So Many Coups? : Parallels The Asian nation has a reputation for being peaceful and prosperous. Yet every so often, the army kicks out civilian leaders and takes power. This week's coup was the 12th since 1932. Why Does Thailand Have So Many Coups? Thai soldiers move in on a pro-government demonstration on the outskirts of Bangkok on Thursday. 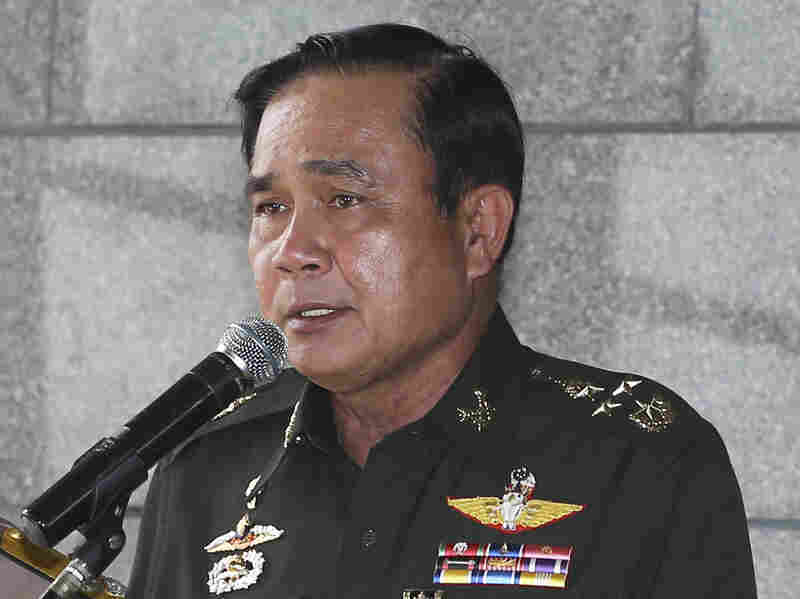 Thailand's army chief Gen. Prayuth Chan-Ocha has announced a military takeover of the government, saying the coup was necessary to restore stability after six months of political turmoil. Thailand has a beloved king. The country has had one of the more prosperous economies in Asia. It's a magnet for Western tourists. Its history is largely peaceful. By most measures, Thailand has been very successful. So why has the country now had a dozen coups, plus many more attempted coups, since it ended its absolute monarchy and became a constitutional monarchy in 1932? The country is so coup-prone that this week's military takeover marked the second time in eight years the armed forces have ousted a leader from the same family. Deposed Prime Minister Yingluck Shinawatra suffered the same fate as her brother, Thaksin Shinawatra, who was overthrown in 2006. Both are considered political outsiders who aren't part of the traditional elite who dominate in Bangkok and other southern parts of the country. The brother and sister built support with populist appeals to the poorer and more rural Thais in the north of the country. Their rise was seen as a threat to many powerful, entrenched interests, including the military. But this addresses only the most recent coups. There are websites that debate exactly how many actual and attempted coups Thailand has had. Answer: somewhere between 20 and 30. Thailand's army chief Gen. Prayuth Chan-Ocha declared martial law at a news conference in Bangkok on Tuesday. The military said Thursday that it was taking power. Thailand had its 12th coup since it became a constitutional monarchy in 1932. Bolivia had a dozen coups from 1952 to 1983. Syria had nine coups between 1949 and 1970. The last one was carried out by Hafez Assad, father of current leader Bashar Assad. Haiti has endured six coups or uprisings since 1956. The country might have been subjected to even more if not for the fact that the military has ruled for extended periods. For example, the military took over from a civilian government in 1947 and remained in power until 1973. Thailand's propensity for coups stems largely from the fact that the military has always played a leading role in politics, and democracy has never really taken root. When Gen. Prayuth Chan-Ocha declared martial law on Tuesday, he cited the Martial Law Act of 1914 that gives the armed forces "superior power" during times of crisis. The military also claimed Tuesday that this was not a coup, a pronouncement greeted with instant skepticism. Sure enough, a coup came two days later. The military argues that in this case, as in the past, it is acting within Thai law and tradition. The military claims the goal is to restore stability and not to take the country in a radically different direction. However, many critics disagree, saying the military simply wanted to get rid of a leader it could not tolerate. The army intervened this time after six months of political gridlock and street protests involving supporters and opponents of Yingluck. The very notion of a coup tends to bring to mind a weak, impoverished, dysfunctional state. Many African nations and Latin American countries were plagued by coups in years past. And military takeovers can sometimes involve deep ideological struggles, with a right-wing military forcing out a left-wing leader. Yet in Thailand, these general features tend not to hold. Rather, Thai coups seem to have their own distinctive traits. 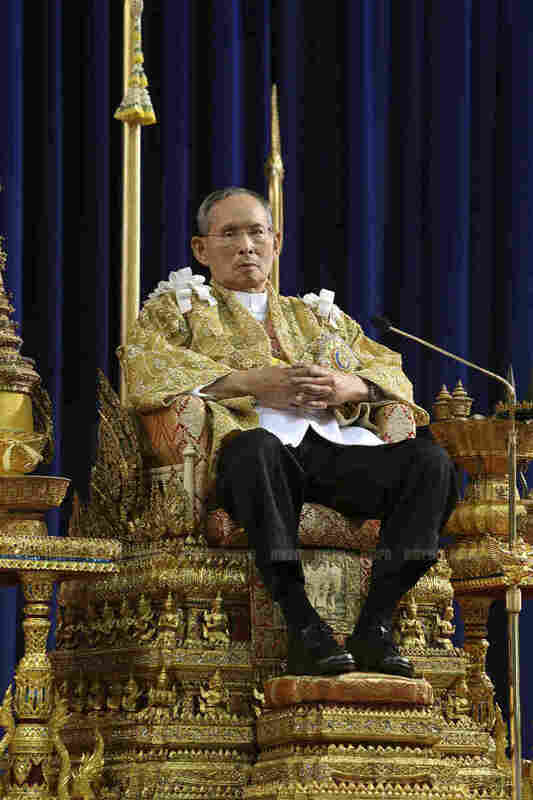 Thailand's King Bhumibol Adulyadej attends a ceremony celebrating his 86th birthday on Dec. 5. The revered king is a stabilizing force in a country that's prone to political turmoil and military coups. The king is a stabilizing force: No matter how much Thai politicians quarrel among themselves, or with the military, no one criticizes King Bhumibol Adulyadej. His elevated status has allowed him to largely stand above the fray and encourage rival factions to work out their differences. But the king is now 86 and frail. His son, the crown prince, is much less popular, raising questions about what role the monarchy will play this time and in the future. They are usually bloodless: As with many previous coups, this takeover occurred without a shot being fired. The military is by far the most powerful force in the country and can seize power without any serious challenge. Thailand's unrest this time has not escalated to the level of widespread violence, let alone civil war. There have, however, been some notable exceptions. The most recent was in 2010, when troops opened fire on Thaksin supporters who had been occupying Bangkok's commercial center and refused to leave. When it was over, dozens were dead. 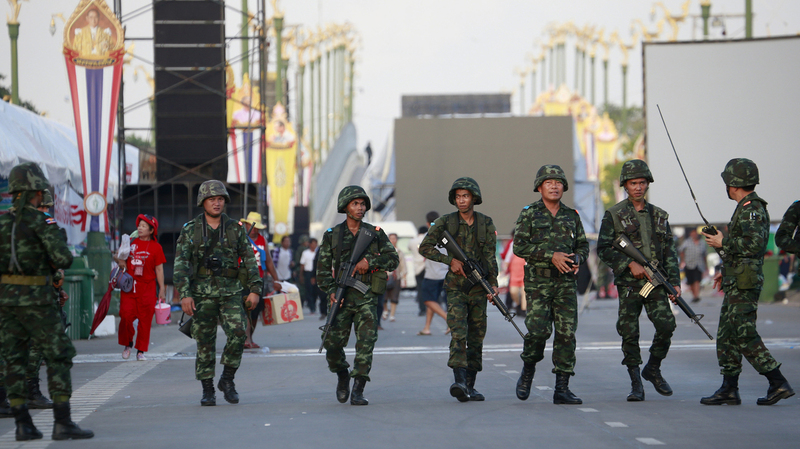 The military hands back power: The Thai military does many of the usual things that armies do when they seize power. It bans or restricts public gatherings, carries out searches and detains suspects. Television channels were cut off Wednesday, except for a screen shot that included a clunky English translation from the "National Peace and Order Maintaining Council." The expectation is that the military will call the shots until it feels the country is ready for civilian politicians to take over again. But this time, as in the past, no one knows exactly when that will be. An earlier version of this story incorrectly stated that Prime Minister Yingluck Shinawatra was removed from office on Wednesday. In fact, she was ousted earlier this month.